Grab your friends and your favorite beverages for a fun social sewing event! 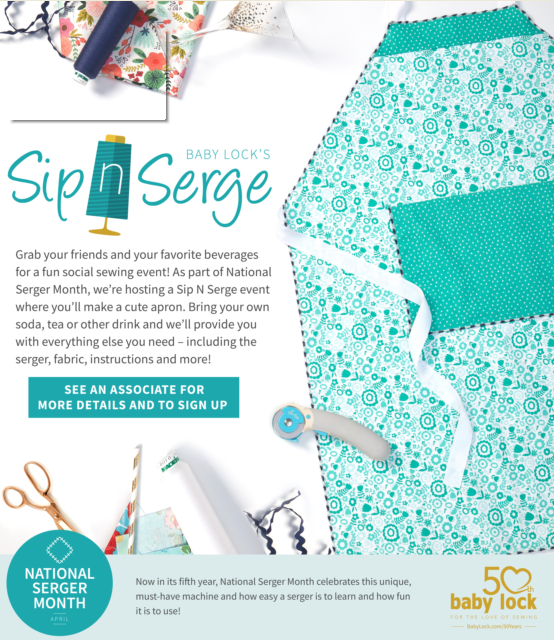 As part of National Serger Month, we're hosting a Sip N Serge event where you will make a cute apron. Bring your own soda, tea, or other beverage and we will provide you with everything else you need - including the serger machine, fabric, instructions and more! This event is great for those who want to or are just starting into the world of serging as well as it is truly for those of all skill levels! Gifts and prizes will be awarded during the session as well! Please call (775)823-9700 to register! All skill levels from beginner to expert!